The IRESite contains information about experimentally studied IRES segments. IRES mRNA regions are believed to attract the eukaryotic ribosomal initiation complex into a close proximity of the mRNA molecule and thus somehow ease initiation of the translation. In contrast to the canonical "scanning model" of the eukaryotic translation initiation, the hereby described IRES promoted translation can be initiated independently of the presence of 5'-terminal 7mG cap structure, which is generally present on most eukaryotic mRNAs (actually on all transcribed by the RNA polymerase II). RNA segments with the IRES activity were first discovered in viruses where they very often play a pivotal role in viral strategies, allowing them to overcome the overall decrease of host proteosynthesis caused by manipulation of the cell by the viral proteins and by the cellular antiviral defense system. Although the IRES segments and thus the cap-independent translation initiation were first described in the eukaryotic viruses, later on many evidences appeared that a similar principle of the translation initiation could be utilized also by some cellular mRNAs. Until 2005, about 50 viruses and 70 cellular mRNAs have been reported to contain the IRES structure while at least 8 cellular "IRESs" were misreported. However, the demonstration of the IRES activity of some RNA region is not a simple task. A proper design of the experiment and a careful selection of experimental controls (especially in the case of quite weak cellular IRESs which are being studied) is very important. Currently, the most common experimental approaches for measuring the IRES activity of a particular RNA sequence are based on the production of bicistronic mRNA. The putative IRES sequence is placed between the two cistrons which encode some reporter proteins (enzymes, fluorescent proteins, etc.). The yields of both reporter protein products are subsequently quantified and the efficiency of the intercistronic sequence in driving translation is calculated, preferrably in respect to known positive control IRES and with proper negative control. Mostly, capped bicistronic mRNAs are ought to be produced from cells transfected with DNA plasmids encoding the bicistronic mRNAs. Unfortunately this is not always the case due to aberrant splicing, appearance of cryptic promoters in the DNA plasmid. Utilization of in vitro translation systems is not much advantageous as it e.g. constitutes a highly artificial system where no competition with other transcripts could occur. However, other methods to prove the IRES activity exist with yet other disadvantages, i.e. the measurement of the translation efficiency of non-capped mRNA containing the examined IRES, or the analysis of the translation of such mRNA molecule in the presence of cap analogs (inhibiting to ceratin extent the canonical cap-dependent translation initiation pathway). It seems the preferred approach would be to use in vitro bicistronic transcripts and characterize their putative IRES segments using direct RNA transfection into the cells although the bench work with RNA forms some other problems. The difficulties in the preparation of proper controls which should false exclude signal (generated by leaky scanning, ribosome hopping, shorter mRNAs produced by their physical breakage or by the existence of artificial transcriptional signals, etc.) make the analysis of putative IRES activity very tricky -- and have become one of the major stimuli for us to create a publicly available database carefully recording the experimental approach used in every individual case. 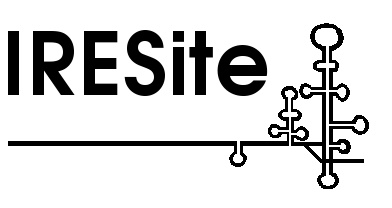 IRESite is designed to present the relevant and curated information about a particular IRES, description of the molecules studied/involved, the methods used to characterize the putative IRES, the primary experimental results including (when available) the experimentally verified secondary structures. Naturally, all records are accompanied by a list of relevant publications containing those results. Where applicable the stored data are linked to external resources like PubMed, GenBank and other databases. Please read the recent NAR2010 IRESite article or the previous NAR2006 IRESite article. IRESite can present up to 92 distinct features describing particular IRES segment and the characteristics of the experimental setup itself. The IRESite database is currently being filled by our curators with data we manually extract from the published scientific literature and assemble using ApE plasmid editor. We welcome anybody from the scientific community to submit new data directly into the database. Our curators are happy to help anybody with the submission process, will verify the submitted data and may contact the author via email when adjustments or additional information are necessary. The IRESite database is and will remain a curated database to ensure the highest quality of its content. It is not a databank where anyone can store any sequence and where only original authors have the right to modify their own submitted data. Understandably, we would like to keep the right to modify the records ourselves - typically in a case when there are typos or some information missing or when more recent data appear. For example, when additional interacting proteins are found, we (or another user) will attach this information to an already existing record. In this sense we also modify the pre-existing record. Most importantly, we will use the attribute IRES_status (read further below) to mark the records as containing functional or defective IRES, or having no IRES at all, along with the scientific knowledge improving in time. However, the IRESite database records will not be modified unless absolutely necessary and we will always try to contact the resp. authors and ask for their aggreement. Whenever someone modifies a record within the IRESite database the version number of the respective section of a given record is automatically increased. presents the activity of IRES in promoting translation - the type of the basic experimental design (in vitro or in vivo), the names and pointers to the positive nad negative controls, the experimental temperature, the quantification of the reporter protein yields, the information whether the cap analogs affect translation, etc. Basically, it is possible to record in the database most of the data presented in any publication. The sequence data of the many plasmids used in experiments can be recorded using proper highly specialized record types which differ by their features. When IRES occurs in some naturally occuring viral or cellular RNA, it is recorded as natural_transcript IRESite record. The purpose of such records to provide summary of the original, natural context in which IRES appears. In contrast, the plasmid_with_promoter_and_putative_IRES_translationally_characterized records cover mRNA sequences derived experimentally (both in vitro and in vivo) from DNA plasmids encoding the bicistronic mRNAs. Let us emphasize that in these cases the IRES segment mostly originated from some donor molecule, mostly viral or cellular genome. The key to understand why we provide this record type is the fact that the resulting mRNA molecule in its complete sequence is artificially engineered and one cannot find such a sequence in any genome naturally. This record contains section named Translation and the data contained therein demonstrate the measured IRES activity in respect to positive control(s) (recorded in IRESite as this record type as well) and negative control(s) (read further below)). It is necessary to record also negative controls which obviously lack IRES. Therefore, negative_control_plasmid_with_promoter_and_without_putative_IRES record type is available and contains between other fetures sequence of the DNA plasmid, of the mRNA molecule and obviously lacks the section named Translation. In some cases, the plasmids used within experiments were poorly characterized in the past (or no measured values were shown in publications or the results were not quantified) and therefore it is not possible to recover the information about measured IRES efficiency. Such records are of the type plasmid_with_promoter_and_putative_IRES_without_translational_characterization and in contrast to the plasmid_with_promoter_and_putative_IRES_translationally_characterized lack the Translation section characterizing the efficiency of IRES. To test whether a putative IRES segment has in its DNA form a promoter activity promoter-less_plasmid_with_putative_IRES contructs can be recorded in the database. These records for obvious reasons lack the mRNA sequence and have only associated the sequence of the plasmid itself. Also, the section Translation is missing as there is mostly nothing to be characterized (no promoter exists and thus no mRNA is transcribed). Even in the cases when promoter has been found by this approach most such experiments did not aim to characterize the expressed mRNA and this is also out of the scope of IRESite. In summary, this record type is merely annotated plain sequence of a plasmid. What are the many record types useful for? From a single research article we typically extract/reconstruct all the plasmids with corresponding bicistronic mRNAs, calculate (if not already available) efficiency of the putative IRES segment to promote translation in scale to a positive and negative control. To keep track of the positive and negative controls used for subsequent characterization of putative IRESs we deposit the control records into the database first so we can link to them later. In brief, we first create the records for negative and positive controls, then for promoter-less plasmids (if any) and only afterwards we deposit the measured re-scaled data about the newly characterized IRES. The positive controls were typically contrasted to a previously reported IRES so assembling such records may take more effort. More on this is available in the Information for submitters document. The IRES related research is developing rather fast and sometimes new facts appear, showing that the previously reported "IRES segment" does not exist at all and that the originally observed IRES-like activity was a result of some other mechanism which unexpectedly twisted the experiment. For example, unexpected promoter in a DNA plasmid used to express the bicistronic mRNA molecule containing the putative IRES can render non-uniform population of mono- and bicistronic mRNAs (similarly appearance of alternatively spliced products leads to same situation). Thus the experiments characterizing efficiency (and de facto the existence) of the putative IRES cannot be evaluated correctly. In summary, when the integrity of mRNA transcripts is not verified by sufficiently sensitive methods serious misinterpretation of the experimental data could happen (and it did in the past at least in 8 cases). We wish to mark clearly the proven IRES segments and to separate them from any defective IRES segments, possible junk sequences and preliminary data with insufficient experimental evidence, etc. This distinction is realized by the functional_status and conclusion columns of the IRESs section with values. Although in most cases the data deposited into IRESite is our work scientists are welcome to deposit their own results into the database directly. The data will be verified by our curators and after mutual communication will be published on the internet. However, there is only one column where curators can use their "power" and change the original value set by the user. The column is the conclusion column mentioned above. However, such changes will always be explained in the resp. Remarks section. In the ChangeLog record users can find more information about any changes which might have been done. We believe the conclusion field will prove to be useful and trusty.